Space Concordia wants to launch a satellite. The countdown: T minus two years. Currently, the student group has two satellites—ConSat-1 and Alexandr. The society rebuilt ConSat-1 after their first Canadian Satellite Design Challenge in 2012. One of the goals of Space Concordia’s next satellite will be testing materials designed by Dr. Suong Van Hoa on whether they can self-heal when hit by micrometeorites—tiny space particles that, when traveling at high speeds, can inflict significant damage. Dr. Hoa is a Concordia engineering professor and has worked on composite structures since 1979. Prior to takeoff, the satellite has to meet several protocols and structural specifications, which are all outlined in a document that’s hundreds of pages long. According to Moore, it’s a long-term process that can take several years. In a perfect world, Moore said, the satellite would be launch-ready by 2018, after the next CSDC. The 2018 competition would mark another opportunity for Space Concordia to shine. Since its creation six years ago, Space Concordia has achieved a trophy-shelf of awards, including first place at the recent CSDC in Ottawa this past June. The society has medalled at every competition it’s competed in, winning against student groups from around the world. “We’re a bit of a dynasty in that sense,” Moore said, smiling. Moore attributed the winning formula to the society’s willingness to challenge its members. He also emphasized the community and collaboration as reasons that Space Concordia has thrived since its inception six years ago. They hope to continue attracting a wider range of students as they move forward with events geared towards those not in the sciences. Space Concordia’s celebration of World Space Week, which commenced on Oct. 4, includes a speaker series, movie night, and planetarium visit. Canadian Space Agency president Sylvain Laporte will be participating in a wine and cheese event on Oct. 7. Being a niche interest-specific group, part of Space Concordia hopes to reach students from non-science and engineering backgrounds. While a strong knowledge and understanding of astronomy and physics is required for many positions, there are ways for other students to become involved. Moore referenced Space Concordia’s videos showcasing its rocket and balloon launches, saying that the opportunity was there for students to assist in the creation of those videos. 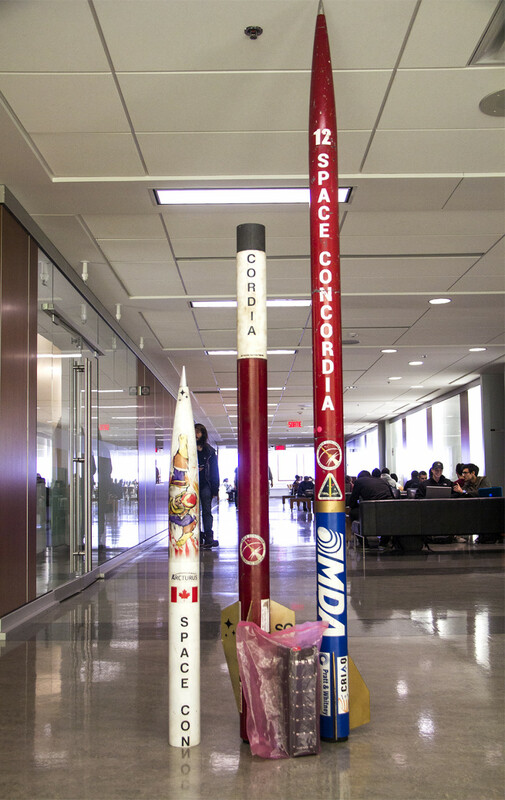 Initially founded in 2010 as a way for students to compete in the CSDC, Space Concordia has evolved into a space fan club of sorts. In their Hall building offices downtown, there are 11 autographed pictures from astronauts, including Canadian Chris Hadfield, former International Space Station Commander.